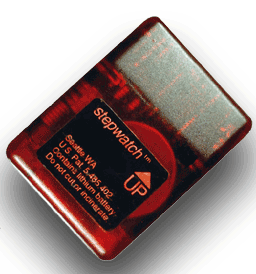 The StepWatch 2 system was produced by Cyma from April 2002 until December 2003. Prior to April 2002 the system was produced and sold by Prosthetics Research Study. Cyma has assumed responsibility for all customers of the StepWatch 2 system. While the StepWatch 2 was a great product, there is always room for improvement. The StepWatch 2 differs from the new system in a number of ways. It was about 1 oz (27 g) heavier than the new model because its housing was solid urethane. The sensor mechanism was considerably different, and the old system was more susceptible to environmental factors such as moisture and static electricity. The docking station of the old system used the standard serial port, required 3 AA batteries and had no indication lights. The new docking station uses USB, which powers the dock so no batteries are required. It also has 3 indicator LED's to provide feedback to the user. For our existing customers, we are offering some incentives to upgrade their system to the new StepWatch 3. For those who choose to stick with the StepWatch 2 system, we will continue to support the system for the foreseeable future. We still have some stock of this system, available in limited quantities.